Idealized “business cycles” don’t exist. This note concludes a series that aspires to illustrate how misunderstanding business cycles created problems for investors and the Fed – and how these can be overcome. Investment models are broken when they are blind to change. Mistakenly believe aggregate price measures (including, core, trimmed, sticky and others) reflect those of individual products people buy. Miss lower product costs, deleveraging, global dilution, disjointed regulation and hollowing-out of middle class. Wait for “too much money chasing too few goods” to result in inflation or “reflation” (depending on cycle point). Miss that productivity, available resources and Potential GDP are greater than generally assumed. The traditional labor productivity and workforce growth equation is largely broken. More helpful measure is product-level price-quantity relationships. These would be adjusted by the primary supply constraint in a country. In stable, developed countries, this would be regulatory/structural/tax reform. In less stable countries, this would be the World Bank-sponsored Worldwide Governance Indicators, including the Heritage Foundation’s Index of Economic Freedom. Miss the distinction between productivity that mostly yields earnings improvement versus production and sales growth. Too much of the former is a death spiral. The latter reflects powerful investment opportunity and advancement in societal health. 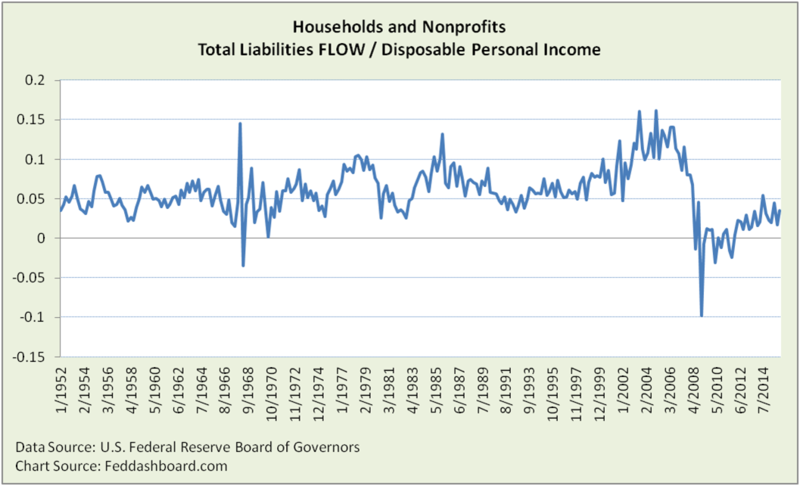 Debt bubble – For decades, the Fed has been like a parent cleaning up after a child, successfully finding ways to minimize the damage of growing debt. Equity bubble – Seeking a “wealth effect,” the Fed created an equity bubble. Two bubbles limit the Fed’s options in reducing strain of both bubbles, especially as the winners of the equity bubble mostly aren’t the debtors. The “two bubble” problem reflects conflicts within monetary policy. Conflicts extend to banking prudential policy, and then to fiscal and regulatory policy. Of these, regulatory policy seems to hold the most hope for improvement with least direct cost. But, it is little discussed and historically embroiled by interest groups. In financial flows, natural rate of interest is lower – get used to life at the lower bound in politically stable countries with open trade. A lower natural interest rate for structural, not short-term, reasons suggests it’s time to revisit how the Fed targets interest rates. Lower rates can be good for growth, but are a painful adjustment for savers, higher quality bond buyers and central bankers. For savers, this will be more painful until the U.S. Federal Reserve’s financial asset bubble is reduced by growth in tangible products. For retirement savers, problem is greater because while prices of many products are falling, prices of health care needed by retirees are increasing. Health care and general retirement planning call for increased allocations to savings if rates of return fall. In tangible flows, stagnant or falling wages. This reality exists whether measured in real per capita, share of GDP or income percentile. Income percentiles are increasingly important the more the middle-class is hollowed-out, to see the consumption effect. Lower wages and underemployment combine to drain consumption from the circular flow of our economy. Changing this forty-year old downtrend in wage share of business revenue isn’t about monetary policy and isn’t fixed with a higher minimum wage. Further, transfer payments don’t have the full economic pump value of private wages. Governments will churn and investors must dodge the bullet. What do these have in common? The “Tech & Trade Tango” are beneficial trends but naturally disruptive. To fully benefit, the opportunity is to better leverage and shape them. Don’t bet on idealized business cycles. They are averages hiding answers. Macro and fundamental investors, reset investment model inputs to avoid the mistakes above. This is especially true for those using industry sector approaches based on business cycles. Quantitative and technical investors, do not assume past patterns. Instead, learn from those who wrongly expected: inflation from quantitative easing (QE), bull market to be shorter or factor contributions to be stronger (but were swamped by QE). Housing is a big-ticket item tracked in three ways: construction investment, purchase price and then monthly consumption of housing as rent to a landlord to an implicit rent or owner-occupied property. For more on the price and investment methods (including the “Treacherous Triangle”), see our Housing analysis section and dashboard. For consumption, see our Money & Prices analysis section. Next Article Leverage – who’s got it in Brexit negotiations?